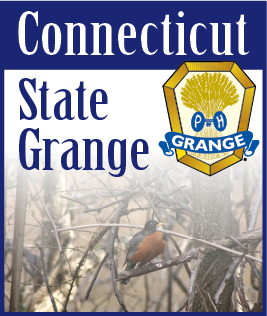 There are different types of Granges across Connecticut. Grange #1 often misses their meetings, sometimes due to bad weather or other circumstances, but many times due to lack of members to meet a quorum. This Grange many no longer have a meeting hall, or if they do, it most likely is in a state of disrepair. This Grange is declining. Grange #2 is meeting once a month, but barely makes a quorum. This Grange has one or two small events a year to raise some funds to keep the Grange going for another year. This Grange either no longer has a Grange Hall, or if they do have a hall, it may need at least a good cleaning, or even a paint job and some repairs. This Grange is barely existing. Grange #3 meets once or sometimes twice a month. This Grange hosts a dinner, a Bake Sale, a Fair, or an event of some type a couple of times a year. They may even have a community service project they work on each year. They might get 10 or 12 members out to a meeting, or 15 or even sometimes 20 members to a meeting on a special occasion. This Grange is surviving. Grange #4 meets regularly, and will often have a good turn-out at meetings, and even fill the hall on special occasions. They have a number of events, and are always working on community service projects or activities. Their Grange Hall is clean and reflects their community accomplishments. This Grange is working toward growth, and often thriving. In looking at the Granges of Connecticut through the eyes of a non-member, what do they see? Do they see a dilapidated old building, screaming for a paint job and with little signage, which rarely has cars in front of it? Do they see a building that they recognize the name of, but know little more about the organization? Or are they familiar with the group and the building, visiting it frequently for events and activities? For those Granges that do not have a Hall, how is your group perceived by nonmembers? Does the community even know your group exists? Here’s a few suggestions to help improve the appearance of your Grange Hall / meeting place in the eyes of the community. -- Paint the exterior of your Grange Hall. A coat of paint can go a long way. If the building has siding, a power washing could make all the difference. -- Keep the area around the building clean. Pick up trash, and remove unnecessary items. -- Spruce up the landscaping around the building. Make sure the yard is kept neat, and that the lawn is mowed in the summer and the snow is plowed in the winter. Plant a few flowers - or even a community garden! -- Add accent lighting. Solar lighting prices have dropped to where they are very affordable. Line the Grange walkway with solar lights, or even accentuate the sign on the front with a spotlight. -- If you do not have a Hall, perhaps your Grange members can lend a hand to help improve the location where your group is meeting. Sprucing up the outside of your Grange Hall can take your Grange from declining to existing. Or from existing to surviving. Or from surviving to thriving. When members are actively involved with their Grange - even if that involvement is planting a community garden or mowing the lawn - those members feel a sense of enthusiasm and responsibility toward the organization, believe that their involvement is helping to make a difference, and take pride in the outward appearance of the Grange in the community and particularly that of their building. Non-members will notice the difference, and see a group that they want to know more about, and perhaps even be a part of. Looking for custom brochures and flyers your Grange? Send an email to Bob at publicrelations@ctstategrange.org or Terri at information@ctstategrange.org with your needs and questions, and we can get the process started for you.